Is this the future of sailing? - published on Mar 2, 2015 by Red Bull - In the spirit of progression, Roman Hagara and Hans Peter Steinacher have devised a new 6 meter catamaran that is redefining what's possible on the open ocean. It's a vessel that can reach eye-popping speeds of 36 knots while hardly being affected by the ocean conditions. How, you ask? Because it doesn't sail on the surface of the ocean, but uses a hydro-foil to lift the cat above the water and over the chop while still maintaining maximum speeds. So, we'll let you be the judge...is this the future of sailing? Endeavour programme preview gets young Bermudians on the water - published on May 28, 2015: Bermudian youth sailors received a sneak preview of the America’s Cup Community Sailing Programme - Endeavour. Flagging America’s Cup Receives Lift as Louis Vuitton Expands Sponsorship - NYTimes.com: "Louis Vuitton, long the commercial partner and namesake of the America’s Cup challenger series, has signed an agreement to expand its role in the next Cup in Bermuda in 2017. The move, a surprise in some sailing circles, is a significant boost for the venerable event, which has lost commercial and sporting momentum in recent months because of challenger withdrawals and hotly disputed rule and design changes...."
Light winds and tight knit racing meant an amazingly close finish in Lisbon, as Leg 7 of the Volvo Ocean Race came to a close. Each team gets the same points as their finishing position--first place gets 1 point. All legs count and lowest score overall wins. Catch the live action as the fleet enters Lisbon in a tight race for podium placements! Pulling the trigger | Volvo Ocean Race 2014-15 - May 26, 2015 - The final stage of leg 7 has begun. All crews are exhausted as they push their limits to gain the last crucial miles in the race to Lisbon. Inside Track: Leg 7 # 7 | Volvo Ocean Race 2014-15 - published May 26, 2015: "It's a three way drag race to the finish in Lisbon [Team Brunel, MAPFRE, Dongfeng Race Team] - who will come out on top? We'll find out tomorrow." The Austria Cup will take place in the ‘chocolate box’ town of Gmunden, on the northern shore of Lake Traunsee, a lake nestled in the heart of Austria’s Salzkammergut mountains to the east of Salzburg. 2015 will be the third occasion the picturesque resort and spa has played host to the GC32s and was the venue for the class’ first ever regatta when three boats joined the lake’s annual Allianz Traunseewoche (sailing week) in 2013. Foiling: sailing's greatest revolution - published on May 11, 2015 - Chris Draper, Morgan Larson and Yann Guichard explain why foiling is entering in a new era of yacht racing. Inside Track: Leg 7 # 6: Shakeup | Volvo Ocean Race 2014-15 - May 25, 2015: Big shakeups amongst the fleet over the weekend as they race through the Azores High in the final countdown towards Lisbon. Gains and losses | Volvo Ocean Race 2014-15 - May 25, 2015: The fleet is coming out of the Azores High heading towards a bigger breeze where the rich get richer on the big sprint to Lisbon. Team Vestas Wind’s incredible journey to rejoin the Volvo Ocean Race was nearing its final lap on Friday. The rebuilt boat emerged out of the Persico boatyard ready for the trip from Italy to Lisbon. Bem-vindo to Lisbon! | Volvo Ocean Race 2014-15 - Volvo Ocean Race Village opens Monday, May 25, in Lisbon, Portugal. Come join the fun in one of the most stunning European capitals! The Azores High | Volvo Ocean Race 2014-15 - The new guy onboard Team Brunel, Adam Minoprio, explains how the fleet is spread out. Trying to catch up | Volvo Ocean Race 2014-15 - published on May 24, 2015 - Sam and Libby on Team SCA discuss taking the long route around the Azores High. Will their risk pay off? “That’s MAPFRE... they may be friends, but not right now,” grumbles Spaniard Pablo Arrarte on Team Brunel about his compatriots. Are you ready Lisbon? | Volvo Ocean Race 2014-15 - published on May 21, 2015: With an estimated time of arrival currently at May 27, join us for the live broadcast of the fleet's arrival into Lisbon, finishing the seventh leg of the race from Newport, US. Vestas Wind update | Volvo Ocean Race 2014-2015: "... In a huge logistic operation managed by GAC Pindar, the boat was skilfully hoisted off the rock and coral reef on to a Maersk Line ship, and transported via Malaysia to Perisco’s yard in Bergamo, Italy, for a rebuild. The team had long planned their target to be on the start line of Leg 8 departure on June 7 from Lisbon to Lorient, France..."
The team are getting ready to leave Persico Marine. The painting is complete, the stickers are on, and we've even got a new face in the boatyard this week. On 1st January 2015 at the Volvo Ocean Race "Life at the Extreme" Awards Night in Abu Dhabi, Team Vestas Wind OBR Brian Carlin spoke of his experience on board the Vestas Wind on 29th November 2014. His story was met with a standing ovation and was soon after followed by the announcement of Team Vestas Wind's return to the Volvo Ocean Race 2014-15. As the fleet settles out under the ice limits, teams reflect back on the chaotic conditions of yesterday, Abu Dhabi hits an underwater stopper, and Sam Davies updates us aboard Team SCA. It’s Leg 7 of a nine-month marathon. Abu Dhabi Ocean Racing is the overall leader, currently six points ahead of Dongfeng Race Team. But Charles Caudrelier won’t give up and let Ian Walker win that easily - his men are still in the hunt for the first place. From heroes to zeroes | Volvo Ocean Race 2014-2015: "... caught for a day in a transition zone near the ice exclusion zone and in sub ten winds, the fleet has slowed down – but it’s cold, and it’s stressful. Seriously stressful. There are 0.6 nautical mile between Jens’ boat, currently first, and MAPFRE, second. Less than 3nm between the first five boats. And 8nm of total spread for the fleet...."
Today we call both the second and first place teams to hear about the current crazy racing in the Gulf Stream, and think back on this leg of the race 9 years ago. Parkour athletes Jason Paul & Pavel "Pasha" Petkuns take freeruning skills from the streets to the Volvo Ocean Race! US Sailing launches the series premiere of "The Beat" at the Volvo Ocean Race Newport Stopover in Rhode Island. Foggy freezer | Volvo Ocean Race 2014-15 - published on May 19, 2015: Sluggish, freezing, and exhausting. Welcome onboard Team Brunel, where the sailors are coping with the North Atlantic conditions while they’re heading for better conditions. A very close cross in pitch black for Team Alvimedica, warmer conditions for the fleet now in the Gulf Stream, and an update from Iker Martinez onboard Mapfre. As the fleet takes off on leg 7, we take a look back on the incredible start in Newport and the difficulties the sailors are facing in the Atlantic Ocean. The Volvo Ocean Race marks a sad anniversary today. Nine years ago, Dutchman Hans Horrevoets, 32, of ABN AMRO TWO, was washed overboard at night on the New York to Portsmouth leg of the 2005-06 race and became the fifth sailor to die at sea in the history of the event. First Sanctioned Key West-to-Cuba Sailing Race in 50 Years Begins | NBC 6 South Florida: "Five teams of American Hobie Cat sailboat racers departed Key West's South Beach Saturday morning on a Key West-to-Havana race, believed to be the first U.S. government-sanctioned sailing race between the two cities in more than 50 years. The Havana Challenge features 16-foot Hobie Cat catamarans, most skippered by Florida Keys-based sailors, navigating more than 90 miles across the Florida Straits to Cuba...."
Record-setting turnout for Volvo Ocean Race: "...“I've been following the race online and it was just a dream come true to be able to watch it here in Newport,” said Oliver Neal, who drove from Toronto. “People live sailing, they love it,” said a man who traveled all the way from Spain. “Newport is special.”..."
Newport Leg 7 start highlights | Volvo Ocean Race 2014-15 - published on May 17, 2015: The Newport sun came out and the shoreline was pack to send off the fleet, across the Atlantic to Lisbon. Watch live - May 17, 2015, 14.00 EDT / 18.00 UTC. Ocean debris is a growing issue - and here, Volvo Ocean Race sailors describe their experiences and emotions on what is becoming an ever more serious problem. Leg 6 best navigator | Volvo Ocean Race 2014-2015: "All Volvo Ocean Race navigators have given their feedback to B&G for the Leg 6 Navigators Prize. And the winner is the same guy than Leg 5, aka Abu Dhabi Ocean Racing's Simon Fisher, whose team took second in Newport. Check out his comments ...."
A vision for the future | Volvo Ocean Race 2014-2015: "... The race will look into what can be done to improve the boats on a number of fronts including energy generation and consumption, and communications. Ainhoa Sanchez /Volvo Ocean Race These improvements would be announced at the METS boat suppliers' trade show in Amsterdam from November 17-19 of this year. The fleet would then be refitted between November 2016 and May 2017..."
Inside Track: Team Vestas Wind update | Volvo Ocean Race 2014-15 - May 14, 2015: The Team Vestas Wind rebuild is nearing completion at Persico Marine, so Genny checks in with the team for an update on status of boat and crew. We're getting closer and closer to rejoining the race, but it's not all smooth sailing at Persico Marine. The team is back together and the boat is still on track, but there's still work to do as we prepare for Lisbon and Leg 8. It's preparation stations! A look back at Leg 6 of the Volvo Ocean Race--Dongfeng Race Team needs to fix its water shortage problem, Team Vestas Wind is fighting the odds to get its boat back in the race in Lisbon, and Team Alvimedica rolls the dice to try and get ahead of the fleet in a bold move…. Search for missing Malaysia plane yields uncharted shipwreck - The Washington Post: "... Michael McCarthy, a senior maritime archaeologist at the West Australian Maritime Museum, said the wreck was of a cargo ship built in the mid-to-late 19th century, and could be one of hundreds lost during voyages across the Indian Ocean. “We’ve got quite a lot of stories about ships that sank in the Indian Ocean mid-voyage and you would be struggling to tell which is which unless you had a complete catalogue of all the ones lost,” he said." Still Time To Push The Boat Out With Free Sailing In Nottinghamshire! An aerial POV of Dongfeng Race Team's tense light air battle with Azzam on their final approach to Newport, shot on OBR Sam Greenfield's DJI Phantom 2+. Inspiring the next generation | Volvo Ocean Race 2014-15 - Three-time Volvo Ocean Race veteran, Ken Read, gives us his thoughts on the Volvo Ocean Race Academy and how it's springboarding the next generation of sailors. Gunboat G4 - Antigua Sailing Week 2015 - Chasing the G4 on the last day of racing with my drone, somewhat sketchy when trying to keep up at 25kts in big seas. 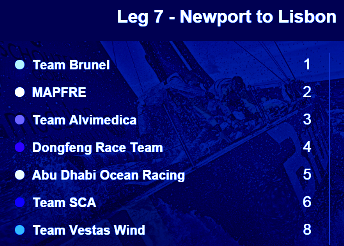 Live recording: Newport arrivals - published on May 9, 2015: The 17 day journey from Itajaí, Brazil, to Newport, USA, finished with a nail-biting fight between Dongfeng Race Team and Abu Dhabi Ocean Racing. This is the live recording of the Leg 6 arrivals. Celebrating Newport | Volvo Ocean Race 2014-2015: "... The amazing thing about Newport is that, even though the Volvo Ocean Race has never docked here before, the residents already feel a strong connection to it - and its history. “I love the race," continues Alexander. "I’m from Newport, so growing up here I’ve seen the likes of Ken Read and other local sailors take part, and I’ve been following it. “We always hoped that this global race would come to Newport one day, and I follow it all the day - checking the tracker all the time, and the game!"...." *Each team gets the same points as their finishing position, e.g., first place gets 1 point. All legs count and lowest score overall wins. In-Port Race results are only used in the event of a tie in the overall Race. Leg 6: quickfire review | Volvo Ocean Race 2014-15 - "
Published on May 9, 2015 - The skippers go under the spotlight to give us a quick review of leg 6. The best yet | Volvo Ocean Race 2014-15 - May 8, 2015: Team SCA arrived in Newport on Thursday, May 7 in sixth position after a long yet constructive Leg 6. “The best leg yet,” declared skipper Sam Davies on the dock. Addis and Tienpont join Team Vestas Wind | Volvo Ocean Race 2014-2015: "Team Vestas Wind have recruited two talented and experienced offshore sailors into their crew for the planned return to the Volvo Ocean Race 2014-15 from Leg 8. The team will be joined from the Lisbon stopover onwards by Tom Addis and Simeon Tienpont. Addis will navigate the Vestas Wind boat throughout the final legs of the race. Tienpont will replace Tom Johnson as bowman as the latter has decided to accept a position within the Oracle Team USA. Australian Tom Addis, 45, is a two-time Volvo Ocean Race veteran – having competed with both PUMA and Teléfonica Blue as navigator in previous editions – and has participated in multiple transatlantic crossings and Sydney to Hobart races... Experienced Dutch sailor, Simeon Tienpont. 33, formed part of the America's Cup winning team Oracle Team USA on two occasions and has one Volvo Ocean Race under his belt as an under 30 with ABN AMRO TWO in the 2005-2006 edition of the Race..."
"Flag of Key West, Florida" by Jmckean - Own work. The Havana Challenge is scheduled to begin May 16 and will involve five to seven 16-foot Hobie Cat catamarans that will travel the 90 miles across the Florida Straits. organized by him, his wife Capt. Carla Bellenger and Capt. Joe Weatherby. The three captains started making the trek via Hobie catamarans in the late 1990s as part of their personal adventure sailing trips. The last trip made by any of the crew was in 2001, after which the annual event was put on hold. The event is being sponsored by the nonprofit Key West Community Sailing Center. A portion of the proceeds from the event will go to youth sailing scholarships at the sailing center, organizers said. The Bellengers, who run kayak, sail and ecotours in Key West, decided to resurrect the trip last year, and along with Weatherby, have been working with the U.S. State Department, Coast Guard, Department of Commerce and other federal agencies to obtain the proper licenses and permits. The commerce permit was the last major hurdle they had to clear. Marina Hemingway Cuba: "Marina Hemingway, run by the governmental Cubanacán, is Cuba's largest marina with an official capacity of up to 400 vessels..."
Pre-Castro yacht race put St. Pete in yachtsmen’s sights | TBO.com and The Tampa Tribune: "... Gerald Hamill was 14 years old when he first made the 284-mile trip from his home in St. Petersburg to Havana, Cuba. If his high school – or parents – had any real notion of what the teen would find in the Cuban capital with a crew of adult sailors, there’s not much chance Hamill would have gotten permission to join one of the most famous yacht races in Florida’s history. “They had a party for the fleet at the Bacardi rum factory. If you want to see a bunch of hungry dogs in a meat market, think of a bunch of sailors in a rum factory. They had every kind of cocktail you could drink, all these hors d’oeuvres,” said Hamill, now 77, “I’ll never forget it. It was totally surreal.” That’s one of Hamill’s tamer recollections from the 1953 St. Petersburg-Havana Yacht Race. The race that ran from 1930 to 1959 recalls a lost era in the Cuban capital, a time when Ernest Hemingway could be found arm wrestling men twice his size in a waterfront bar and dictators would show off new resorts to groups of American yachtsmen. “I saw Hemingway a number of times sitting at the bar, normally half-smashed with an entourage of people. He was friendly guy,” Hamill said. St. Petersburg yacht designer Charley Morgan also encountered the great expatriate writer, whose name still graces Havana’s marina...."
Volvo Ocean Race 2014-15, Leg 6 Newport Finish Video - May 7, 2015: After an intense fight between the Franco-Chinese and the Emirati boats, the emotional relief was great. Charles Caudrelier couldn't be happier with his comeback and is still battling for first place. Inside Track: Leg 6 # 13 | Volvo Ocean Race 2014-15 - with less than 100 miles to Newport and the two leading sailboats neck and neck, listen to Dongfeng navigator Pascal on tactics, and from hometown Rhode Islanders Charlie and Amory on Alvimedica. May 7, 2015: Watch Team SCA live as they arrive into Newport, US, completing Leg 6 from Itajaí, Brazil. Burgers await | Volvo Ocean Race 2014-15 - May 6, 2015: What's America all about? Eric Peron (thinks he) knows the answer to that one! Watch him as he explains his idea of "The United States". Star spangled race village | Volvo Ocean Race 2014-15 - A sunny day in Rhode Island to open the Race Village! The crowds turned up to kick off the Newport stopover in style. The race village for the Volvo Ocean Race stopover in Newport has opened, kicking off a 12-day celebration of the offshore sailing event. Gov. Inside Track: Leg 6 #12 | Volvo Ocean Race 2014-15 - May 5, 2015: The Newport finish is in sight for the fleet, or at least their minds, especially for the Americans. Matt Knighton shares a special memento and Team Alvimedica get sent some, while the fleet compresses in another bungee effect on Leg 6. VOR fleet now in the Gulf Stream, less than 2 days from Newport, Rhode Island (USA), the finish line for Volvo Ocean Race Leg 6. Go with the flow | Volvo Ocean Race 2014-2015: "The Gulf Stream is a powerful and warm current going from the tip of Florida and along the eastern coastlines of the USA and Newfoundland before crossing the Atlantic Ocean. In the Gulf Stream, the colour of the water changes – it’s bright blue, while coastal waters are less salty and have a green or grey shade. The temperature gets higher..."
May the 4th be with you | Volvo Ocean Race 2014-15 - May the 4th, a day to remember for every Star Wars fan, and it seems there are a few of them onboard Abu Dhabi Ocean Racing.